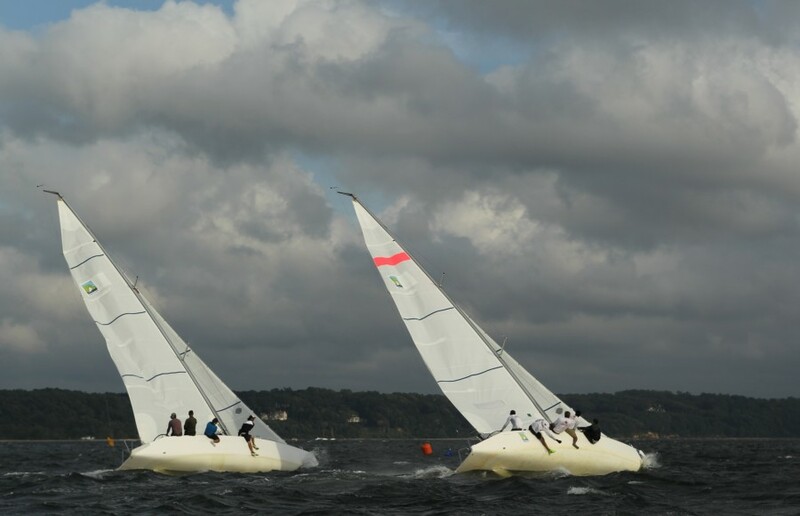 The Match 40′s were pressed to the limit today in 16-22 knots of breeze with gusts up to 33 in Cold Spring Harbor. 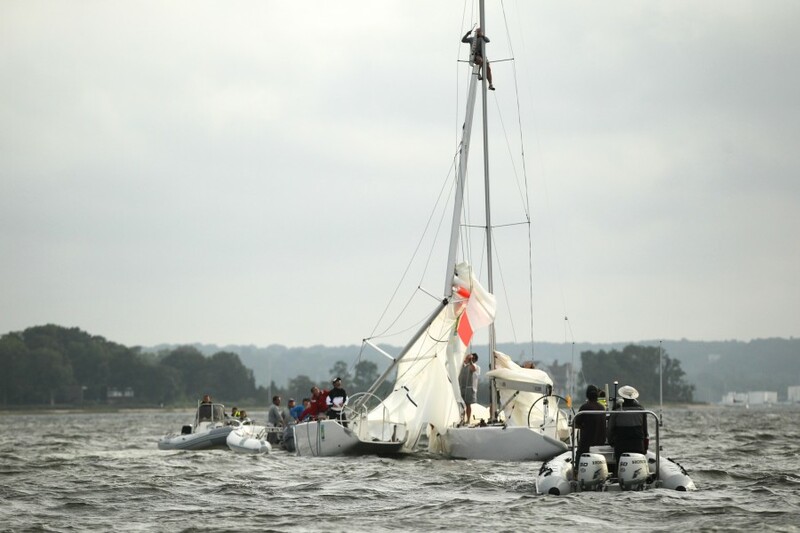 The breakdown boat crew worked almost as hard as the racers, tending to broken jib sheets, lose keel bolts, broken spinnaker poles and blown out batten pockets. Just before flight 10 and the first race of the day, the RC heard of a tornado watch in Brooklyn, NY. Preparations were made for severe weather to hit the race area by locating lifejackets and other safety equipment. Flight 10 went off with quick 18 minute, 2 lap races with close to 19 knots of breeze. Some boats had problems rounding the gate marks so the gate was widened for flight 11. Boats 3 and 5 required repairs after flight 10. Team Dave Perry were on their way to victory for flight 12 but their boom made contact with the flag pole on the RC boat while crossing the finishing under spinnaker, so the win was given to Vladimir Lipavsky. During the second quarterfinal, Dave Perry, who was racing against Taylor Canfield at the time was heading upwind on starboard about 5 lengths from the top mark as Vladimir Lipavsky had just rounded and was heading downwind on port with no spinnaker. Both skippers were confident they would clear each other when a puff hit and Perry’s mast caught Lipavsky’s backstay and brought the Russian’s mast down. Perry, who asked for redress, remarked “I feel sick to be involved in a situation resulting in boat damage. The good news is no one was hurt.” Perry had rights over Lipavsky who was on port and required to keep clear. Ralfie Steitz, crew for Perry, went up the rig to cut loose the tangled rigging. Ralfie is quite familiar with working aloft, and was tether balled around the rig of Stars and Stripes during the 1995 America’s Cup in San Diego on the day that One Australia sank. It is undermined whether either team will get their boat damage deposit of $2500 back. Flight 13 was started with RC flying a Z flag, signaling no spinnakers, due to the consistent heavy breeze and multiple breakdowns, including a broken spin pole on boat #8. 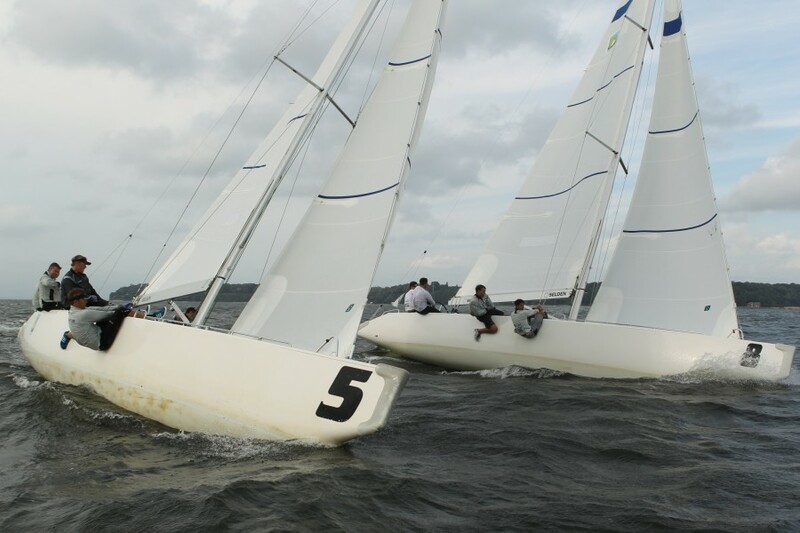 Also for F13, all competitors were asked to remove the second batten in their jibs to even the playing field since a few boats had blown out their batten pockets and sail repair was not an option in the conditions. Just after completing F13, Chris Poole was seen jumping into the water and surfacing with baton in hand. “He didn’t want to lose any of his damage deposit,” a crew member said. Overall an intense day on the water dispelling all rumors of Oyster Bay being a light air venue. The day finished with a hungry crew downing 500 clams shucked by local Baymen, 200 sausages and hamburgers cooked by umpire Hans Graf, and 10 large pizzas. All are fueled up for tomorrow. There will be round robin to determine places 5, 6, 7 and 8 between Quaglio, Reece, Lipivaski, and Perry.